In our opinion, gingerbread is only worth eating if its flavor is unmistakably bold and spicy. For our gingerbread bundt cake, the standard liquid combination of mild molasses and water seemed lackluster. Robust molasses had more presence in our scaled-up cake, and we replaced the water with stout for a deeper flavor profile. The beer gave the cake a malty tang that tasters loved. Powdered ginger provided a spicy kick, and a little cinnamon and allspice contributed warm notes. Blooming the spices in melted butter_ a technique the test kitchen uses for savory spiced dishes_ intensified their flavor, but tasters still wanted more ginger. A bit of grated fresh ginger added another layer of heat that the dried spice alone couldn’t muster. And another traditionally savory ingredient, black pepper, added a mild bite that further enhanced the ginger flavor. 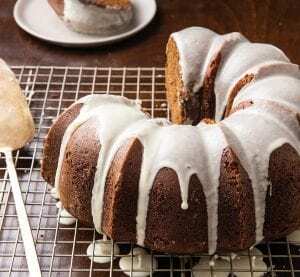 We used the glaze as one final opportunity to turn up the heat by mixing a little ground ginger in with the confectioners’ sugar and adding a few tablespoons of ginger ale to thin the glaze to just the right consistency. Guinness is the test kitchen’s preferred brand of stout for this cake. Be sure to use finely ground black pepper here. Do not use blackstrap molasses in this recipe. An equal amount of orange or lemon juice can be substituted for the ginger ale in the glaze.